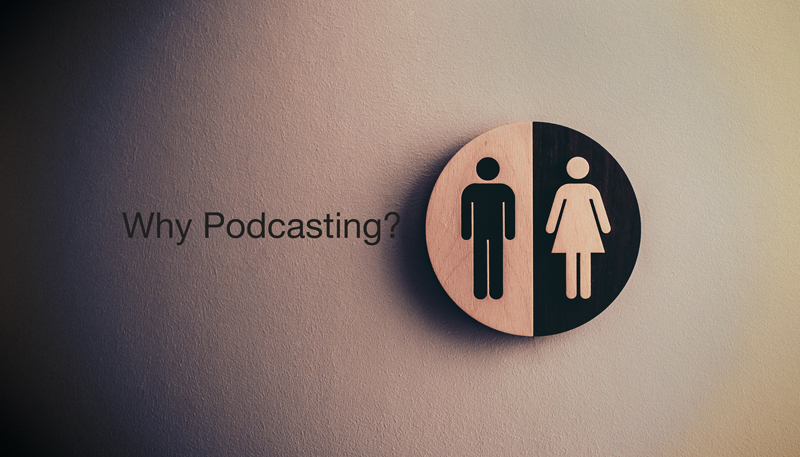 Podcasting is a form of broadcasting that is utterly quantifiable. You know exactly how many subscribers you have and how many episodes have been downloaded. That’s great for developing your own Podcasting Masterplan… but it’s not the most powerful reason why podcasting is good for you! To discover why, read on! Any repetitive physical activity that you can do on autopilot, e.g. the gym, walking the dog, gardening, ironing, commuting, driving a familiar journey. Are those three true for you? Two of these three zones are intimate zones – times and places where you do activities that you are unlikely to share with anyone else, let alone on social media. You may let someone close to you into zones one and two, but that’s a privilege and a sign of your trust. How fascinating, then, that these three zones are where many people listen to the radio and to podcasts. When we are at our most relaxed, trusting, and open-minded to new ideas (hence the link to creativity), we open our ears to relative strangers. At The Boardroom Network we talk about the ESC key on the keyboard as a reminder and acronym for what we offer: Education, Support, and Connection. Podcasting can offer all three of these. We all know podcasts are great for education and even entertainment. Loyal audiences form tribes who can support one another through online interaction and even meet-ups. However, the most important and unique advantage of your podcast is the personal sense of connection you are going to create through them hearing your voice. If your audience is listening to you at these times where they are enjoying their own space, they’ve invited you, as if you were an intimate friend, to join them. And they are listening to your voice. Your voice is the spark that animates your content – adding levels of emotion, empathy, and inspiration that are hard to create via the written word. You’ve also joined them on their terms – one giant leap over radio. Radio, in the main, is scheduled. You listen when it’s broadcast (and, yes, I have heard of catch-up but not all stations provide this.) Podcasts are downloadable adding yet another layer of freedom of choice to the experience – your audience listens to you when it suits them. Better than video? Surely not! Those of you who know me, know that I spend most of my time producing videos and writing. Why would I of all people recommend Podcasting as potentially superior to blogging and vlogging? Video posts are the sweetheart of Social Media and of Social Media platform providers… but maybe it’s going to be dumped for a more intimate lover. Jerod’s point in his article is clear, Podcasting is the one form of consumption that frees you up to fidget and do something else at the same time. It’s convenient consumption on your terms. As he says, if you’re reading, you really can’t do anything else (although I know people who read in the bath and on the bathroom throne!) And contrary to what we may think, doing something else at the same time is not distracting if it involves a different area of the brain. This is one form of multi-tasking that works! Aside. This is one reason why I love to coach people while we walk together. There is an association with ‘freedom’ when we walk (as it is our first major breakthrough as a child, alongside learning to communicate). Walking and talking together is a liberating experience. I know you’ve got great content in you. Now, all you need is the connection. Podcasts give you the channel and means to connect – in the deepest sense of connection. And while people listen, their own brains will be making connections – creating ‘Aha!’ moments that they may well thank you for, for the rest of your life. That’s deep! I want to commit to broadcasting 52 episodes of our very own Podcast over the period of a year. I’d like to start asap. And I’d like it to star YOU! This is a golden opportunity for you to build a permanent asset that will go on working for you for as long as you like. You’ll take the time out to record ONE episode then that’s it – no more of your time is required. I’ll record you, I’ll edit the recording, and we’ll publish it on your behalf and the behalf of The Boardroom Network. This is your chance to get your voice heard, and to help people get to know you, like you even more, and trust not only you but the products and services you deliver. The latest statistic is that customers need not seven but fourteen touch-points before they’ll trust and commit. 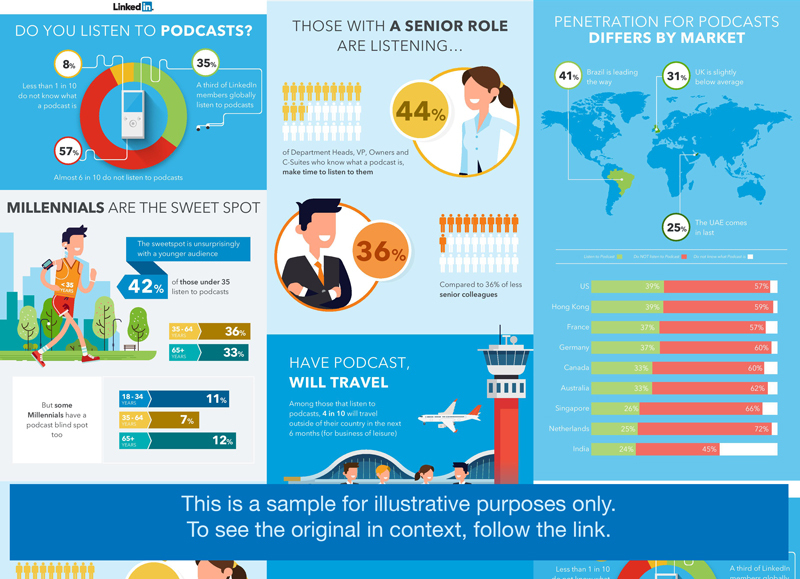 Podcasting can become one or more of your marketing channels – making that connection with your potential customers. 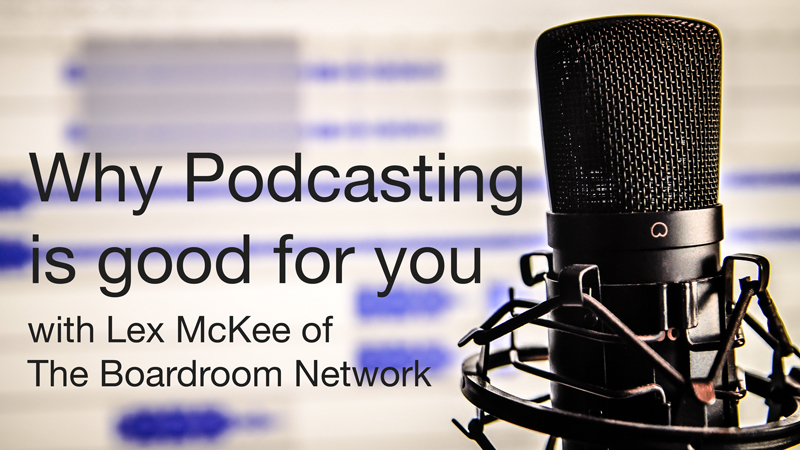 Once it’s recorded and published, your Podcast becomes like a frontline customer-facing team-member, working 24/7 as an ambassador for your brand. Let me echo the commitment once more: I’m only asking you to record one episode with me. The Boardroom Network as a whole will publish 52 episodes, but you will only need to do this once. Of course, if you get the bug, you’re welcome to record more! We’ll keep the format simple. Of course, we’ll need to know who you are, and who your customs typically are. You may well have some anecdotes concerning your customers – bringing their avatar to life for the listeners. We’ll then jump straight into the deeper “Why”. “Why do you do what you do?” This will give you a chance to tell your story. Help us get to know you, to like you, to trust you. I’ll ask you to share, “What the three key points people would benefit from knowing in your subject are.” Just three. Then we’ll chat about them. If there’s an element of, “How to do something,” I’d be delighted for you to share. And we’ll make it easy for people to contact you: the how to, when, and where. Finally, just for fun, we may ask what your favourite book is, your favourite movie, and your favourite song. We might do that earlier on in our discussion! No surprises. No awkward questions. Just a chat between friends. How much? It won’t be free – it’s a part of your future marketing – but it won’t be expensive. Again, let’s chat about how reassuringly inexpensive this powerful marketing channel can be. ps. while we’re setting up a Podcast feed, I’ll be placing the podcasts on our YouTube channel, and will provide a downloadable link from our Google Drive. In the spirit of this podcast, the YouTube video is not a video that you’ll need to sit and watch. It’s simply a host for the audio so that you can listen and then do other things at the same time. It would help us if you would subscribe to our YouTube channel… that way you’ll get alerts when the next episode is ready. Notice the article in the first link refers to ‘know, like, trust’ too. Opportunity knocks and the audience is listening! The UK Retail Market – A Perfect Storm?